(CNN) -- Four British soldiers have been killed in one day in separate attacks in Afghanistan, the British Ministry of Defense announced Friday. 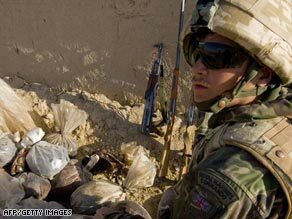 A British marine with an opium haul in Helmand province, where the four soldiers were killed. The deaths happened in three incidents in the southern Helmand province, the ministry said. Two soldiers were killed in a suicide bombing that happened Thursday afternoon during a patrol in Gereshk, the ministry said. One was a member of the Royal Gurkha Rifles and the other served with the Royal Military Police. "With heavy heart we report another extremely sad situation, where lives of our courageous soldiers have been sacrificed for the greater good of the Afghan people," said Lieutenant Colonel Nick Richardson, a spokesman for Task Force Helmand. "Our deepest and heartfelt sympathies go to their families and loved ones and we offer our thoughts and prayers to them all at this most painful and distressing time." Earlier in the day, a soldier from The Black Watch, 3rd Battalion The Royal Regiment of Scotland was killed by a gunshot wound, the ministry said. He had been on patrol with the Afghan National Army in the vicinity of Woqab, close to Musa Qala.